No, not Guinness but the drink that makes a large proportion of IT Services tick – coffee! But there’s a problem; the coffee machine in the SIC has broken after several years of faithful service it’s given up the ghost. So for the last couple of weeks there has been discussion about what to get to replace it. While Paul Cheeseman has a dream of buying a large commercial coffee machine (“with the two jugs”) it’s maybe a bit too big. So looking for alternatives we had the idea of investing in cafetieres. I found a nice looking stainless steel dual walled one so I’m going to order one for the office – if it doesn’t work out then I’ll pay for it myself and take it home! If anyone has any recommendations then post a comment and save us from caffeine-free agony! 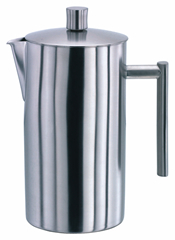 I see the stainless steel cafetiÃ¨re has a “lifetime guarantee” – is that the lifetime of the cafetiÃ¨re or the buyer? If the buyer were to be the university, what is its “lifetime” – until it changes its name again? 1.2 litre, ever so shiny coffee cafetiere. This isn’t just coffee, this is IT Services Coffee. Shiny Coffee Pot mmmmm!! A stainless steel dual walled design makes it sound like a nuclear sub, or NASAs latest mars explorer. The order has been placed so fresh coffee will hopefully be making a return next week!